Price: $10.00 (at the time of this article, it was a collector's item asking many times this price. 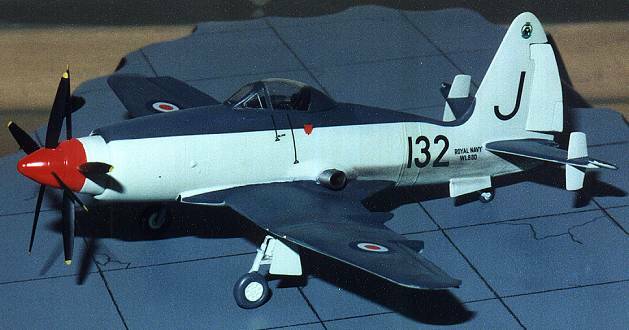 Without a doubt, one of the neatest looking aircraft was Westland's twin turboprop Wyvern strike fighter. 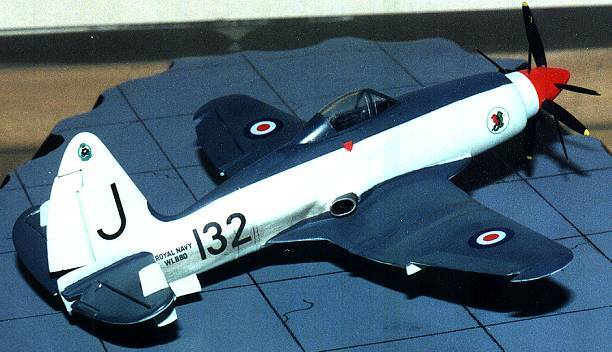 Developed when jet naval aircraft were still an uncertainty, the Wyvern had problems of its own in reaching production. The turboprop was supposed to give nearly the speed of a jet without the huge amount of fuel consumption. Well, unfortunately, this was not the case with these early engines. After many years of development, the Wyvern did finally enter service in the mid 50's only to serve with a handful of units and then be withdrawn from service after only a few years of operation. They did see action during the Suez War of 1956 and acquitted themselves well, but the handwriting was on the wall and the days of the prop driven attack plane were over in the RN. Frog's kit is typical of the day; i.e. minimal detail, interior, and easy to build. Actually, this kit has an interior that is not that bad for the day coming with actual side panels and a rather decent seat and instrument panel. When starting on this kit, I decided to cut out all the flight surfaces and display them in other than the neutral position. A rather easy job considering the design of the kit. I simply scribed the hinge lines until the part came free. I also used Aeroclub's white metal landing gear as it is superior to the Frog items. I built the aircraft clean as I did not have replacement rocket rails and rockets for the badly shaped kit items. I also left off the auxiliary fuel tanks. Assembly was a breeze with the parts fitting quite well, thank you. Filler was used in the normal areas (fuselage, wings) and the kit painted sky lower and extra dark sea grey upper. I even used the Frog decals and they went on well and did not react negatively to the rather strong setting solution I used to get the underwing serials to snuggle down to the rather convoluted surface therein. The end result is a nice model of an unusual subject. I know that the Russians have the mold for this, but why they have not released more of these is a mystery. Highly recommended if you can find it and can you tell that I painted this one with a brush!